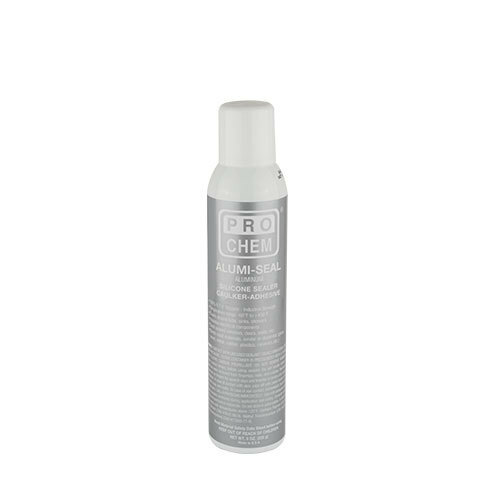 ALUMI-SEAL | Pro Chem, Inc.
ALUMI-SEAL is a multipurpose silicone sealant. It is a non-slump, paste-like, one-component RTV (room temperature vulcanizing) gasket-maker. When applied as a formed-in-place gasket, it reacts with moisture in the air and cures to a rubber like product. 1. Surfaces must be clean, dry and free of oil, dirt and dust for best adhesion. 2. Apply a continuous bead of 1/16” to 1/8”. 3. Dries in 1 hour, fully cures in 24 hours and reaches optimum strength in 7 days. Leave a small bead of material which will form a sealing “plug” for reuse. To use, gently pull “plug” and begin to use material. If plug breaks leaving the dispensing tip sealed, use a paper clip or other wire object to remove and loosen the remainder of the cured material.